The fall season was an incredibly successful one for San Clemente High School as all seven sports teams took home league titles and advanced to the CIF-SS postseason. 18:07 – The time for junior Hana Catsimanes on the 5,000-meter course at the CIF State Cross Country Championships at Woodward Park in Fresno on Nov. 24. Catsimanes finished 16th in the Division 1, which is the highest Triton finish at State since Melissa Eisele finished in 11th at 17:51 as a senior in 2013. Catsimanes was named First Team All-CIF-SS for a seventh-place finish at 17:03 on the three-mile course at Riverside on Nov. 17, and the junior set a personal record of 16:50 at the notoriously fast Woodbridge Classic on Sept. 15. 22 – The number of years between back-to-back league titles for the San Clemente boys water polo team. The Tritons previously completed the feat in the 1995 and 1996 seasons and repeated the act with last season’s title and this season’s undefeated (8-0) South Coast League campaign. The Tritons outscored their league opponents 114-44 over the eight games and scored 18 goals four times. 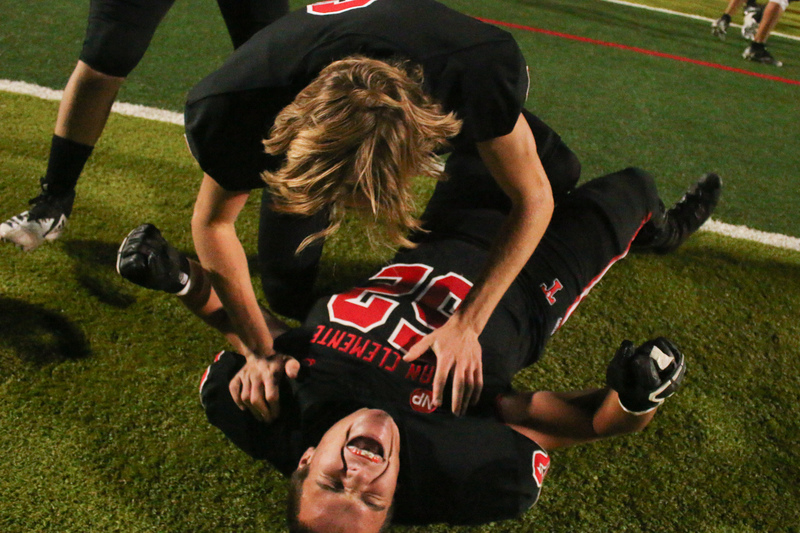 San Clemente finished eighth in the CIF-SS Division 1 playoffs. 76 – The total goals scored by junior Christian Hosea for the water polo squad. Hosea was far and away the team’s goal-scoring leader by nearly doubling his second-place teammate junior Hayden Kahn’s 39 goals. Hosea was also the team leader in points at 105 and finished second with 29 assists. Hosea scored a season-high five goals in the Tritons’ first win over Dana Hills, 10-9, on Sept. 18 and scored four goals in seven games this season. Hosea’s total was nearly a quarter of San Clemente’s total scoring output. 1999 – The last year the San Clemente football team had beaten Mission Viejo and won a South Coast League title before Oct. 19, 2018. After a 1-4 start to the season, the Tritons won six games in a row, including the 21-20 upset of Mission Viejo and a Division 1 playoff victory against Murrieta Valley. San Clemente had Sea View League titles in 2014 and 2015, but the Tritons hadn’t won the South Coast League since their last defeat of Mission Viejo in the previous millennium. 278 – The yards thrown by backup quarterback Drayton Joseph in San Clemente’s win over Mission Viejo. On the first play of the second quarter, Oklahoma State-committed senior Brendan Costello was knocked out of the game, and University of San Diego golf commit Joseph came in to attempt his first varsity passes. Joseph completed 17 of 28 passes for two touchdowns to put the Tritons in position for the win. 15 – The total tackles for senior Ryan Altman against Mission Viejo. Altman led the team in tackles for the game with five solo and 10 assisted, including four tackles for loss. The biggest of all those came with 3:05 remaining. Mission Viejo had scored a touchdown, and after a San Clemente penalty on the extra-point attempt, the Diablos attempted to take the lead on a two-point conversion. Altman split the line and made the tackle in the backfield to clinch the win. 0 – The number of 2017 league wins and 2018 league losses for the San Clemente girls volleyball team. The Tritons went winless in the 2017 South Coast League campaign, but the girls rebounded to go 8-0 in 2018 and win the Sea View League. The Tritons rode their momentum into the playoffs, where they scored a second-round sweep of No. 3 seed and previous league rival Dana Hills to advance to the CIF-SS semifinals. 5 – The number of consecutive shared South Coast League titles between the San Clemente girls tennis team and Dana Hills. The Dolphins took the first match, 10-8, on Sept. 20 at San Clemente, but the Tritons evened the score with a win at Dana Hills, 11-7, on Oct. 12. San Clemente’s No. 1 singles player, Jenna Yeam, finished second at the South Coast League Finals and qualified for the CIF-SS tournament but did not compete. The Tritons advanced to the second round of the CIF-SS Division 1 team bracket. 31 – The point total for the San Clemente boys cross country team at the Sea View League finals on Oct. 30. The Tritons put their scoring five runners all in the top nine finishers to win the league title by a 22-point margin. Senior Denilson Lopez-Guerrero, junior Caleb Mettler and seniors Patrick Riley and Elijah Sech finished back-to-back-to-back-to-back from fourth to seventh place. 73 – The score for junior Mariana Gandia-Mak at the CIF-SS Individual Golf Championship on Nov. 1 at the River Ridge Golf Club in Oxnard. The 1-over-par score put her in a tie for 14th place to advance to the CIF-SCGA Southern California Championship, where she shot a 13-over 86 to tie for 82nd. Gandia-Mak shot a seven-over 79 at the CIF-SS Southern Individual Regional to qualify for the championship.